Afruz Amighi’s visual vocabulary lies somewhere between light and shadow, between the real and the ethereal. The first solo show in the UK of the Iranian-American artist at Sophia Contemporary Gallery in London features nine new wall sculptures, all made by materials that the artist has been meticulously collecting throughout the years—all involving steel, fiberglass mesh, and chains. Eight graphite on Mylar paper drawings pictorially, as well as aesthetically, compliment the sculptural works. Afruz Amighi, The Denier, 2017. Steel, Fiberglass, Mesh, Chain and Light, 44 x 26 x 16 inches. For this exhibition, Amighi’s narrative embarks from the ancient Greek myth of Echo, a mountain nymph who, according to Ovid in his Metamorphoses, helped Zeus over his affairs with other fellow nymphs by distracting his wife goddess Hera with endless conversations. When Hera discovered the truth, she cursed Echo with only being able to repeat another person’s most recently spoken words thus withdrawing the ability to express her emotions, especially when she fell deeply in love with vain Narcissus. By creating a chamber for her Echo—Echo’s Chamber, the title of the exhibition—the artist transforms it into a domain of womanhood where despite the fact that voices may be repeated, they can nevertheless be heard and no longer silenced. 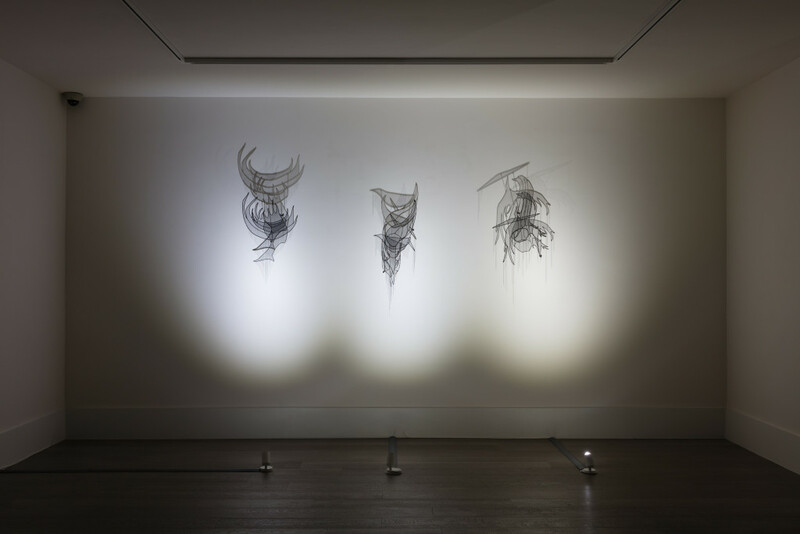 The multidimensionality of the sculptures on display, which with the help of illumination are duplicated or multiplied in the form of shadows over the adjacent wall surfaces, generate an allegorical lifecycle and interplay. It devises an almost oneiric situation where shadows turn into imaginary voices that they reform into shadows once again. The biomorphic shapes of the nine wall sculptures are suddenly activated by the use of light in combination with translucent materials simultaneously rendering a subtle documentation of the surrounding space. Space and architecture have always been within Amighi’s immediate interests. More clearly in previous bodies of work as well as here, but perhaps in a more abstract eloquence, we detect not just the acknowledgment but also the conscious admiration for and reflection of the architectural forms of Islamic mosques and the formulaic principles of Gothic cathedrals with the system of intersecting arches but also the aesthetics of American art deco and urban landscape as this unfolded and evolved from the 1930s onwards. Another source of inspiration for this exhibition derives from the Metropolitan Museum’s collection of Greco-Roman sculptures as well as the 19th century African artifacts incorporating wooden female sculptures and ceremonial masks. The portrayal of gender, emotions and social status through the use of a complex system of lines, innumerable patterns and an array of micro-decorative objects becomes an agency of multi-layered symbolisms. Throughout her career, Amighi has drawn her attention to surveying notions around cross-cultural diversity. In 2009, she received the Jameel Prize for Middle Eastern Contemporary Art by London’s Victoria & Albert Museum for 1001 Pages (2008), a work whose stimulus came from intricate designs related to Iran’s Islamic past and her fascination with the use of materials. 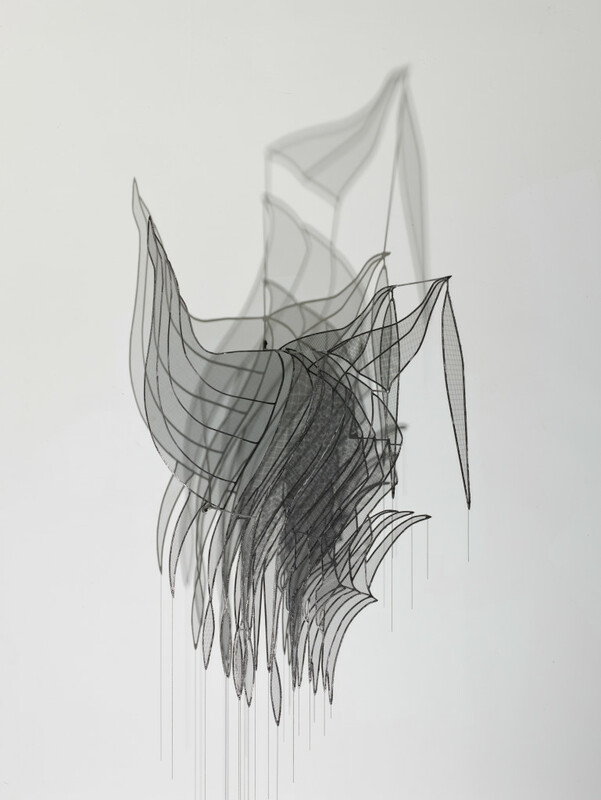 In 2013, she was commissioned by YARAT—a non-profit contemporary art organization based in Baku—along with 16 other artists from Azerbaijan, Georgia, Iran, Russia and Turkey for the 55th Venice Biennale, where light and shadow played a pivotal role in the work that she presented there too. Afruz Amighi, Installation View Echo’s Chamber 2017. 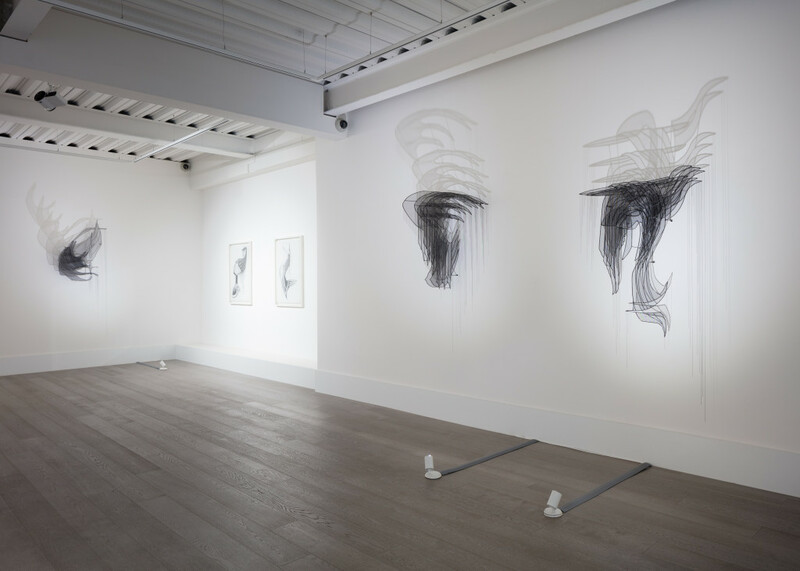 Echo’s Chamber demarcates a shift in Amighi’s practice: from a more obvious architecturally orientated visual lexicon to more abstract counterparts but concurrently focusing on more figurative practices when it comes to drawing. Her female figures, portrayed with headdresses and other fabrics, not only reference the origins of her parents but they also construct a robust commentary on contemporary politics in the US and a male dominant society, on a par with all latest events encompassing sexual misconduct allegations in the workplace and the #MeToo movement. Amighi’s body of work emerges as the next stop following those in previous years. We witness an animated dialogue between her drawings and her sculptures and at the same time we sense that this may lead to somewhere else, perhaps focusing on a diverse narrative. Her practice seemingly and gradually takes her away from her ancestral roots but unavoidably and unintentionally may bring her back there wiser and stronger. Afruz Amighi, Echo’s Chamber at Sophia Contemporary London, UK ran through January 19, 2018. Dr. Kostas Prapoglou is an archaeologist-architect, contemporary art writer, critic and curator based in London, UK and Athens, Greece. March 2, 2018 | Filed under Art Seen: International and tagged with Afruz Amighi, Kostas Prapoglou.